It should go without saying that using your smartphone while driving is unsafe and, in most places, illegal. For years the answer was to suction-cup a sat-nav system from the likes of TomTom or Garmin to your windscreen, replacing the often-terrible mapping system of the car itself. Then smartphone mapping apps improved and those started appearing on windscreens instead. But so did their hundreds of daily notifications and distractions in the form of emails, Instagram Likes and non-stop WhatsApp group chats. The solution is to marry your car’s physical controls, designed to be safely used while driving, with the power of a smartphone. This resulted in Apple and Google coming up with solutions for their customers; CarPlay for iPhone owners and Android Auto for Android fans. Android Auto casts a Google Now-like interface onto your car's infotainment display via USB. It's not the same as mirroring your phone onto the car display using HDMI, as the vehicle's touchscreen, steering wheel controls, buttons and control knobs remain functional when using Android Auto. But this doesn’t mean your entire phone interface appears on the car’s dashboard screen, because that would still be distracting and unsafe. 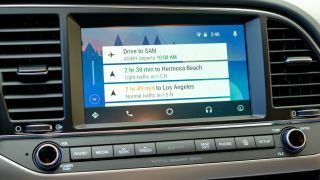 Instead, Android Auto is more like a simplified version of Google Now, with the ability to make calls, play music stored on your phone, send dictated messages to contacts, and of course use Google Maps. Calls and messages will come through (although the latter are read out by Google Assistant instead of appearing on-screen), but all other notifications are completely hidden away in the background. You won’t even hear the ping of a new WhatsApp message until you disconnect your phone. Audio is sent to the car’s speakers via USB for music with no reduction in sound quality, unlike with Bluetooth audio streaming. Phone calls are handled via Bluetooth hands-free. What does Android Auto look like? Although your phone‘s processor is used to run Android Auto, your phone’s screen remains blank while the system is running to prevent distractions. Meanwhile, your car’s dashboard screen is completely taken over by the Android Auto interface. Once you get used to Android Auto, there’s no real need to go back to your car’s system. If you have to, in some models (like those from VW) a short press of the voice command button makes the car listen, while a long press summons Google Assistant. Android Auto has a permanent menu bar at the foot of the screen for quickly returning to the maps, phone or music app. There is also a button for accessing car information and diagnostics, but this is not supported by all manufacturers. The UI shares a lot with Google Now. It has that same card-based menu that's part of Google's unified design language, and it's laid out on a home screen with all of the predictions you'd expect. Without even having to think about it, Android Auto suggests directions on where you might want to go. This is based on recent searches or your daily routine. The weather, missed call or text alerts and in-progress music also appear within this very glanceable menu - it looks a lot like the Android lock screen with embedded notifications. The current time and your phone’s signal strength and battery percentage always appear in the top-right corner, along with a microphone icon. Tap this and you can talk to Google Assistant to get directions, make a phone call, send a text message, or even ask about the weather, or any random question you’d ask a Google Home smart speaker. Which apps work with Android Auto? The answer here is, not many. But that’s exactly the point. You don’t really need to know about that new Instagram message or Facebook event reminder until you get to your destination anyway, so it can’t be seen, heard or interacted with. Instead, you can use maps, make calls, send messages and listen to music, plus interact with a small number of third-party map and message applications.